Victor Mooney of Queens begins his final training row from Jackson's Marina in Hampton Bays to Brooklyn today. Hampton Bays, NY - October 29th, 2013 - Victor Mooney of Queens begins his final training row from Jackson's Marina in Hampton Bays to Brooklyn today. After this row, Mr. Mooney ships the Spirit of Malabo to the Canary Islands where he’ll embark on his fourth bid to row across the Atlantic Ocean to encourage voluntary HIV testing. Mr. Mooney will make stops in Bay Shore, Fire Island, East Rockaway and end at the Gateway Marina in Brooklyn later this week. The rower began his on water training in August from SUNY Maritime College. “Join us in the fight to end AIDS by sharing #hamptonsfighthiv on twitter”, Mooney said. For More Information, you can follow Mooney's journey on Twitter, Facebook, or the official website. 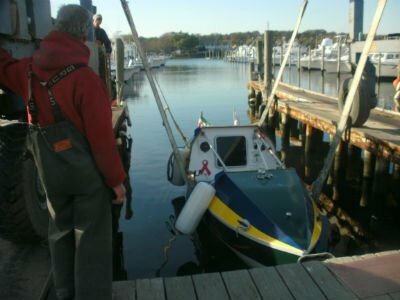 Subject: LongIsland.com - Your Name sent you Article details of "Rower Begins Final Sea-trial From The Hamptons To Brooklyn"